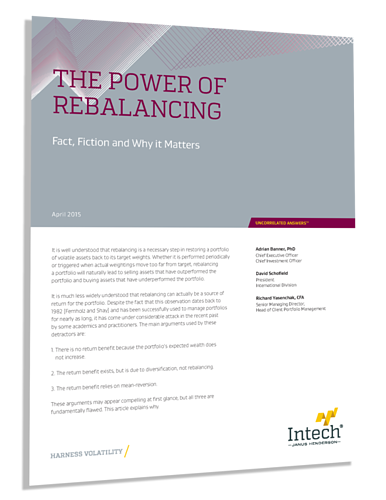 It is well understood that rebalancing is a necessary step in restoring a portfolio of volatile assets back to its target weights. Whether it is performed periodically or triggered when actual weightings move too far from target, rebalancing a portfolio will naturally lead to selling assets that have outperformed the portfolio and buying assets that have underperformed the portfolio. There is no return benefit because the portfolio’s expected wealth does not increase. The return benefit exists, but is due to diversification, not rebalancing. The return benefit relies on mean-reversion. These arguments may appear compelling at first glance, but all three are fundamentally flawed. “The Power of Rebalancing” explains why.